Celebrating its second anniversary, Reliance Jio is now offering 1GB of free 4G data to subscribers having a Cadbury Dairy Milk chocolate. Subscribers need to have an empty wrapper of a regular Cadbury Dairy Milk chocolate worth as low as Rs. 5 or Dairy Milk Crackle, Dairy Milk Roast Almond, Dairy Milk Fruit and Nut, or Dairy Milk Lickables to avail the free data offer. Apart from giving the data to subscribers, Reliance Jio is offering a way to transfer the free data to any other Jio subscriber. The offer is valid until September 30, and you need to have the MyJio app on your smartphone to get the free data. The offer is available exclusively on the MyJio app. To avail the offer the customer needs to first have the latest version of the app updated on their device only then will they be able to view the offer and participate in it. 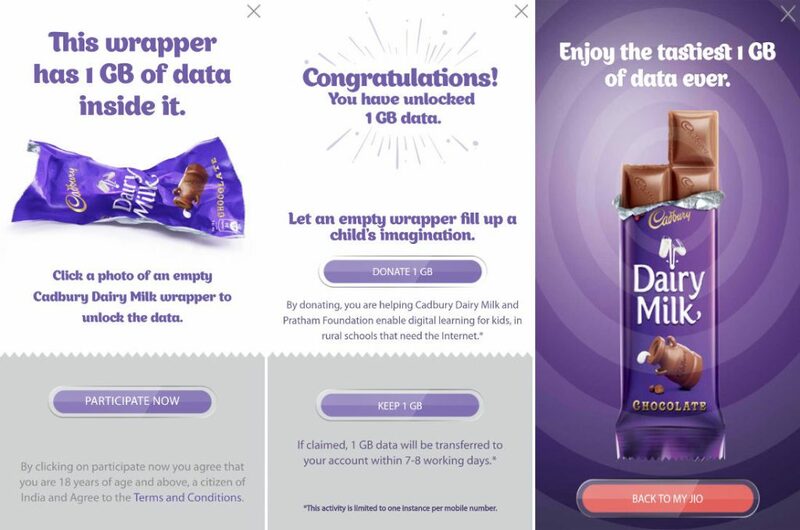 Participation is simple, the subscriber needs to click and upload the picture of an empty Cadbury Dairy Milk wrapper and his free data will be unlocked. To be eligible for free data, the uploader must be an existing customer of Reliance Jio (RJIL) who buys the Cadbury Dairy Milk and then scans the barcode inside the chocolate wrapper using the MyJio app. Cadbury chocolates that can be purchased to avail the offer include Cadbury Dairy Milk chocolate for Rs.5, 10, 20, 40, and 100; Cadbury Dairy Milk Crackle, and Roast Almond for Rs.40; Cadbury Dairy Milk Fruit & Nut for Rs.40 and 80; and Cadbury Dairy Milk Lickables for Rs.35. In this case, the Cadbury Dairy Milk wrapper works as a ‘Voucher for Activation’ for the offer accrued to the eligible Jio customers till the offer’s validity expires on 30th September 2018. Eligible customer will get 1GB of free 4G data. The offered data will be an ‘Additional Data’ over and above the regular RJIL data plan of the Jio customer. The ‘Additional Data’ can be availed by the customer either on his Jio assigned the mobile number or can be transferred to another. Only one wrapper-redemption per registered mobile number is allowed. That means a Jio subscriber cannot avail more than 1GB of free 4G data on a single mobile number. The ‘Additional Data’ will be credited to the customer’s MyJio account within 7 to 8 working days from the date of redeeming the offer. As is Reliance Industry’s norm, they don’t let any opportunity to do a good deed slide by. With the free 1GB of 4G data offer, they have tried to rope in the Jio subscribers in their philanthropic effort. The 1GB data that a user unlocks on his Jio mobile number can be donated. This donation will enable Cadbury Dairy Milk and Pratham Foundation to export digital learning to kids in rural India where the internet hasn’t managed to reach as yet. The giving away of 1GB of free data towards enabling e-learning in far-flung areas of the country is a tasty gesture by both Reliance Jio and Cadbury Dairy Milk indeed. Cadbury Dairy Milk’s parent company Mondelez India Foods Pvt Ltd (MIFPL) hold the final say in any matters leading to the dispute regarding the offer. Though in the case of legal conflict, the Mumbai Courts hold exclusive jurisdiction. Also, MIFPL will not be held liable for any cost incurred by the customer in his bid to avail the offer.